1Jeff Horseman, “Political Veterans Battle for Supervisorial Seat,” 11 October 2014, Orange County Register: n.p. 2State of California, California Birth Index, 1905–1995 (Sacramento: State of California Department of Health and Human Services, Center for Health Statistics). 3See Politics in America 2014 (Washington, DC: CQ-Roll Call, 2013): 134; Almanac of American Politics 2014 (Chicago: University of Chicago Press, 2013): 239; Imran Ghori, “Two Supervisorial Seats to Be Decided in June 3 Election,” 19 May 2014, Orange County Register: n.p. 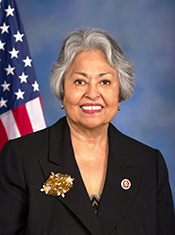 4“Full Biography” in Congresswoman Gloria Negrete McLeod http://negretemcleod.house.gov/about/full biography (accessed 13 March 2014); Politics in America 2014: 134; Almanac of American Politics 2014: 239–240. 5Politics in America 2014: 134; Almanac of American Politics 2014: 239–240; Cynthia Mondoza, “Gonzales Wins With Over 62%,” 7 June 2012, El Chicano Weekly: A3. 6Almanac of American Politics 2014: 240; Raymond Hernandez, “For Bloomberg, a ‘Super PAC’ of His Making,” 18 October 2012, New York Times: A1; “With Guns Blazing,” 19 October 2012, New York Daily News: 34; Election Statistics, 1920 to Present, http://history.house.gov/Institution/Election-Statistics/Election-Statistics/ ; Michael Howard Saul, “Mayor Backs Vote Winners,” 8 November 2012, Wall Street Journal: n.p. ; Sean Sullivan and Aaron Blake, “Mitt Romney Is Back,” 25 January 2013, Washington Post: n.p. 7Richard Simon, “California’s Freshman Class,” 4 January 2013, Los Angeles Times: AA1. 8“Full Biography”; Almanac of American Politics 2014: 239. 9“Full Biography”; Almanac of American Politics 2014: 239. Negrete McLeod had served on a similar committee in the California senate. See Politics in America 2014: 134. 10Congressional Directory, 113th Congress, S.Pub. 113–12: 37. See also “Rep. Negrete McLeod Takes Father of Newtown Victim to State of the Union,” 14 February 2013, El Chicano Weekly: A6. 12Congressional Record Daily Edition, 113th Cong., 1st sess., 20 March 2013: H1641; Congressional Record Daily Edition, 113th Cong., 1st sess., 18 April 2013: H2157. 13Congressional Record Daily Edition, 113th Cong., 1st sess., 13 June 2013: H3950; Congressional Record Daily Edition, 113th Cong., 1st sess., 26 June 2013: H4078. 14Congressional Record Daily Edition, 113th Cong., 1st sess., 14 June: H3031; Congressional Record Daily Edition, 113th Cong., 1st sess., 28 October 2013: H6792; Congressional Record Daily Edition, 113th Cong., 1st sess., 10 December 2013: H7617. 15Congressional Record Daily Edition, 113th Cong., 1st sess., 19 June 2013: H3915. 16Congressional Record Daily Edition, 113th Cong., 1st sess., 12 October 2013: H6557. 17Congressional Record Daily Edition, 113th Cong., 1st sess., 18 September 2013: H5599. 18Congressional Record Daily Edition, 113th Cong., 1st sess., 19 September 2013: H5709. 19Congressional Record Daily Edition, 113th Cong., 2d sess., 11 February 2014: H1770; Congressional Record Daily Edition, 113th Cong., 2d sess., 4 March 2016: H2147. 20Congressional Record Daily Edition, 113th Cong., 2d sess., 27 February 2014: H2064; Congressional Record Daily Edition, 113th Cong., 2d sess., 21 May 2014: H4784. 21Kate Zernike, “New Jersey Congressman Won’t Seek a 9th Term,” 19 February 2014, New York Times: A15. 22Paul Singer, “On Politics,” 23 February 2014, Louisville Courier-Journal: B3. 24Matthew Fleming, “When Being a County Supervisor Is More Appealing than Congress,” 31 October 2014, Roll Call: n.p. 25Ghori, “Two Supervisorial Seats to Be Decided”; Stephen Wall, “Hagman Leads Negrete McLeod for Supervisor,” 5 November 2014, Orange County Register: n.p. ; Biographical Directory of the United States Congress, 1774–Present, http://bioguide.congress.gov/scripts/biodisplay.pl?index=N000187 (accessed 10 August 2015).